POLSON — It wasn’t a pretty for Libby, but the Lady Pirate Soccer team showed their strength as they clobbered the Lady Loggers 11-1 on Thursday, Sept. 15. Polson tallied 21 shots on goal to Libby’s four with six Pirates scoring on 11 goals. Still, Libby pressured Polson from start to finish, according to Coach Michael Hewston. The Lady Pirates earned another win against Columbia Falls on Saturday, edging past the competitive Wildkats, 2-1. Hewston noted that Marina Mayorga and Ashlee Howell handled the 4‐3‐3 attack controlling the midfield and creating opportunities for the attacking group of Alana Fox, Tiara Duford, JaNessa Taylor and Amber Clarke up top, playing it back to the defensive group of Ashley Benson, Olivia Hewston, Sophia Sisler and Amelia Pittsley to maintain possession. The Lady Pirates played Bigfork Tuesday, travel to Hamilton for a 4 p.m. game Thursday and Whitefish for a 5 p.m. game on Saturday. The Polson Pirates traveled to Billings and Laurel Sept. 9-10 for two close non-conference contests. On Friday Billings Central outscored Polson 3-2. Pirates Robin Erickson and Linde Lambson both scored goals with assists by Michael Mercer. Goalkeeper Russell Smith saved three shots on goal for the Pirates. 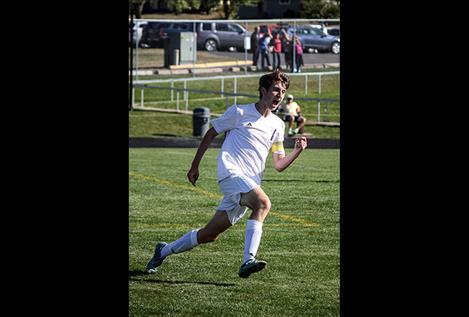 The following day the Pirates’ Andrew Hanson scored a hat trick to beat Laurel 3-1. Mercer and Mack Moderie assisted. The Pirates lost a close conference game, 2-1, to Columbia Falls on Saturday. Daniel DiGiallonardo scored Polson’s lone goal. The Pirates continue their road travels as they played Bigfork Tuesday, will play Hamilton JV on Thursday, and go to Whitefish Saturday.